Some of the best apps in the iTunes Store are apps that deal with astronomy. Astronomy is one of those branches of science in which we all tend to take an interest. Just think of how many television series, novels, and movies have been devoted to adventures in outer space. It is natural for us to see apps devoted to this most pervasive and yet enigmatic of scientific disciplines. 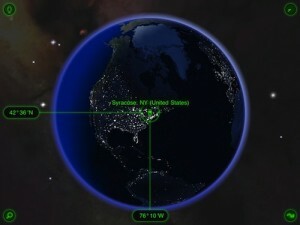 Vito Technologies has held a presence in the iTunes App Store for quite some time with their stargazing app Star Walk. Star Walk has always proven to get “oohs” and “ahs” from people I’ve shown it to. I would even venture to say that Apple has benefitted from increased sales of iOS products due to friends showing off this sort of app. 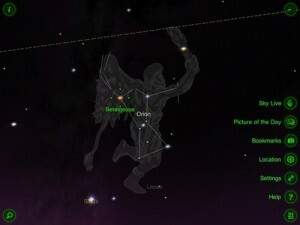 Star Walk is an app that is a skywatcher’s dream. When you first open the app, the first thing you notice is the impressive quality of the graphics. There is a tremendous amount of detail and resolution that helps make your experience on an iPad so noteworthy. 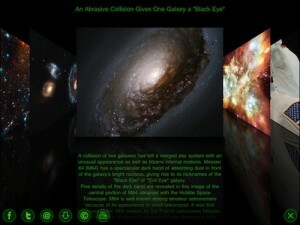 The opening screen provides a wealth of astronomical data that most stargazers can appreciate. The rising and setting times and elevations of the Sun, Mars, Jupiter, Venus and Saturn accompany the impressive graphics of each of these celestial bodies. Further information on the day length is also provided with the Sun’s data. The lunar phases from yesterday to two days from now are also presented in an impressive three-dimensional view. Upon closing that view, you get to see the really cool aspect of Star Walk. Using the iPad’s built-in compass and accelerometers, you’re presented with a view of the sky in whatever direction the back of your iPad is oriented. The display moves as you do, providing a virtual experience that’s quite unmatched in other apps. Let’s say you’re out on your deck enjoying some good times with friends and family and someone notes a particularly bright star in the night sky. With Star Walk, all you need to do is point your iPad at the star and it will appear on your display. Touching the star will give you its name. That’s pretty impressive. The Sun’s path through the sky is highlighted as well, a feature that I plan to use while teaching my Earth Science students about the apparent motion of the Sun. I really like the fact that you can point your iPad straight down to see celestial objects on the other side of the Earth. 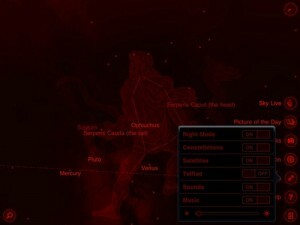 Major constellations are also highlighted when centered on your iPad’s screen in Star Walk. You can turn this feature off if you wish, but I find it interesting. The constellations are not only named, but the ancient images that they each represent appear as well. It shows some of the creativity that early people used in assigning identities to these stellar arrangements. Be honest, have you ever wondered why Cassiopeia appears to be an upside-down “W”? When Star Walk shows her reclining on a sofa as you point at the constellation, you’ll understand why. Touching the clock icon in the upper-right corner of the display gives you the current time and date. You can also virtually speed up or slow down time using a slider along the right-hand edge of the screen. I find this useful as an Earth Science teacher because it allows me to demonstrate how stars circumnavigate Polaris (the North Star) throughout the course of each day. The icon in the lower right-hand corner of the display causes a number of custom feature controls to appear. 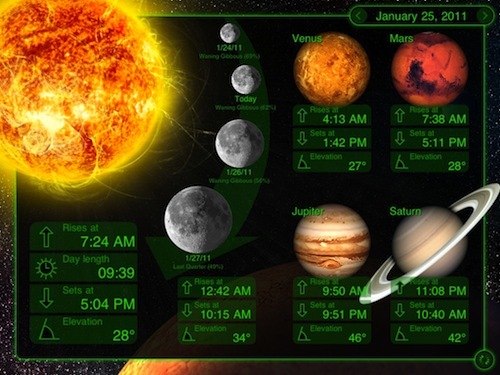 The “Sky Live” choice takes you back to the opening display with information about the Sun, Moon, and various planets. You can also select “Picture of the Day,” which takes you to a CoverFlow view of the images found on the Astronomy Picture of the Day website. You can send links to these images via FaceBook, email or Twitter. You can even download them for viewing later. Copyrighted images have Internet links provided. 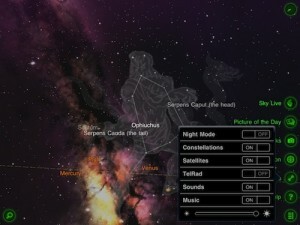 Star Walk is a great app for those of us interested in astronomy and stargazing. It’s always fun to know what you’re actually looking at when observing the heavens at night and Star Walk makes that possible. Star Walk holds a permanent spot on my iPad.